Wiki Education staff members and board chair PJ Tabit traveled to Montreal, Canada, for Wikimania 2017, the annual gathering of Wikimedia editors from around the world. Several staff had presentations in the schedule, and we learned a lot from other program leaders and shared our learnings. We wrapped up our Google Summer of Code internships, with our three interns making great contributions to the Dashboard code base. Special thanks goes to intern Sejal Khatri, who joined us at Montreal for the hackathon, working with Wikimedia Italia’s Camelia Boban to improve the Program & Events Dashboard. Visiting Scholar Gary Greenbaum at George Mason University brought the article about Benedetto Pistrucci to Featured Article. Pistrucci (1783–1855) was an Italian gem-engraver, medallist, and coin engraver who spent 30 years working on the Waterloo Medal, which was presented to the victorious generals at the Battle of Waterloo. In preparation for the start of the fall term, Wiki Education staff conducted a full review of our support materials, including Dashboard output, online trainings, and brochures. We started making a series of changes based on feedback from program participants, Wikipedia community members, questions we get from participants, and updates to Wikipedia. 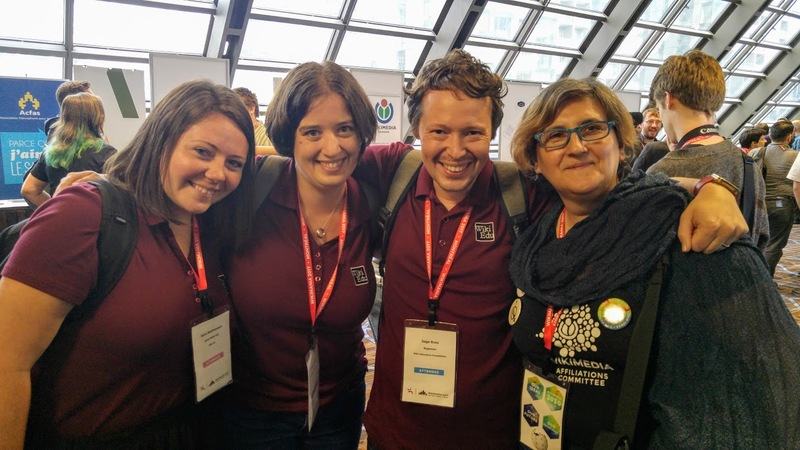 Jami, LiAnna, and Sage pose with Wikimedia Italia’s Camelia Boban at Wikimania. Jami kicked off the month in Washington, D.C. for meetings with aligned organizations. She joined our partners at the Association for Psychological Science (APS) to discuss plans moving forward with their initiative to train psychology students to add high-quality, reliable information to Wikipedia. Jami met with various other association staff, both in-person and remotely, to plan future collaborations. Jami and Samantha run a workshop in Montreal for prospective new faculty. On August 10, Samantha and Jami hosted a workshop in Montreal alongside the pre-conference workshops for Wikimania 2017. This four-hour workshop offered an opportunity for Wiki Education to connect deeply with new instructors and university faculty members in the area who were interested in learning more about teaching with Wikipedia. Since we ran the event the day before Wikimania, the annual global conference for Wikipedia contributors, we had a unique audience of instructors and librarians with varied experiences using the encyclopedia. Each attendee brought their perspective to the table, leading to robust conversations about how to use Wikipedia as a teaching tool in the classroom. Jami discusses teaching with Wikipedia with a prospective instructor at the ASA conference. While in Montreal for this year’s Wikimania conference, Jami and Samantha joined our partner, American Sociological Association (ASA), at their annual meeting down the street. We’re thrilled to have recruited more ASA members into our program, as their students will continue adding important sociology content for the world to learn from. This month is a busy time for Samantha, whose responsibilities include preparing new instructors in the Classroom Program for their first Wikipedia assignment. At the end of August, we had 72 first-time participants teaching 80 courses with Wikipedia assignments. Thanks to Samantha’s guidance, these instructors know how to use Wiki Education’s tools to teach students how to edit Wikipedia. Students edited 15 articles, created 1 new entry, and added 2,040 words. The Fall 2017 term has begun, and Classroom Program Manager Helaine Blumenthal is busily onboarding courses. While our Course Dashboard enables Wiki Education to support an ever-increasing number of courses, a lot of work goes into ensuring that all the courses we support are well-suited for a Wikipedia assignment. This means making sure that all of our courses are following our best practices and that they have all of the necessary resources available to them to ensure success. Above all, we want our program participants to have a meaningful experience all while improving Wikipedia. Throughout August, we made updates to several of our training modules as well as several of our guides and handouts. Each term is a learning experience, and we strive to improve our resources and materials based on instructor, student, and community feedback. To support our courses this term, we’ll again be holding sessions of Office Hours in which instructors will have the chance to meet with Wiki Education staff via video chat to ask any questions they might have about their Wikipedia assignment. Even though the term has hardly begun, our students are beginning to get their feet wet. We look forward to another productive and successful term. You’ve heard of restoring cars, but are you aware that some people like to preserve them as well? A student in returning educator Nadene Eisner’s English 1102-047 class expanded the Preservation and restoration of automobiles article to include not only information on car restoration but also their preservation. Preservation differs from restoration because while the latter is focused on making a car appear as if it just rolled into the dealership, car preservationists approach the car with an archaeological perspective. Their goal is to discover and document all of the car’s original parts and details, then work towards preserving them rather than perform a renovation that may remove these things. If you’ve ever visited a museum that features Ancient Roman art and artifacts, you’ve most likely seen a depiction of an adlocutio. For those of us that aren’t Romanophiles, an adlocutio can be one of two things: it can be an address given by a general or emperor to their collected army or a form of Roman salute that the army would give to their leader. Adlocutios were a sign of power and respect, so it’s no surprise that this was heavily featured in their coinage and artwork and drew the attention of a student from Grace Gillies’s Discovering the Romans class as the summer semester wound to a close. It wasn’t uncommon for some artists to by pair a depiction of an adlocutio with that of a small god, as this would emphasize a figure’s status and divine lineage. Quantum computing has stepped out of the realms of theory and science fiction into the real world. Though still in its infancy, it has the potential to revolutionize computing. This ability of quantum computing to solve problems that conventional computing cannot solve (because it would take too long) is known as quantum supremacy. This month, a student in Amy Carleton’s Online Advanced Writing in the Sciences created the Quantum supremacy article. Students in the class worked on a range of articles, creating new articles about topics as diverse as Language exposure for deaf children, DMTMM (a compound commonly used in organic chemistry), and the Gill plate trade. The impetus for this trade is the demand for stingray gill plates in traditional Chinese medicine. Other students in the class expanded existing articles. Several articles related to mental health were expanded by students, including articles about the Treatment of mental disorders, Selective serotonin reuptake inhibitors, and Separation anxiety in dogs. In the latter case, a student in the class substantially expanded the information in the article about the use of anti-depressant and anti-anxiety medications to treat separation anxiety. Ryan McGrady speaks about the Visiting Scholars program during a Wikimania session. Community Engagement Manager Ryan McGrady joined other Wiki Education staff and program participants at Wikimania in Montreal this month. He organized or co-organized two sessions relevant to Community Engagement projects. A roundtable with Andrew Lih, Associate Professor of Communication at American University and Summer Fellow at Wiki Education in 2015, explored Wikipedia outreach strategies outside of edit-a-thon. We were excited by the response from attendees and look forward to experimenting with some of the ideas people contributed. In another session, Ryan presented about the Visiting Scholars program with Lane Rasberry, Jennifer Dawson, Diane Shaw, and Jackie Koerner. The session’s goal was to spark discussion of the program, where it’s going, best practices for alternative models, and ideas for the future. Lane and Jennifer shared their experience collaborating on a Visiting Scholars project with the non-profit organization Cochrane, improving health and medicine content on Wikipedia. Diane shared her perspective sponsoring a Visiting Scholar at the Smithsonian Institution. Jackie, who is a current Visiting Scholar at San Francisco State University, explained what it’s like to be a Visiting Scholar and what she has learned after a few months in the program. We were thrilled with the participation during the session and conversations that followed and look forward to following up on the ideas attendees shared. Visiting Scholars made some great contributions to Wikipedia this month. Eryk Salvaggio at Brown University developed an article on Oregon’s black exclusion laws, the first of which was in part a response to the Cockstock Incident, an argument over a horse that escalated into a melee in which three people died. Eryk wrote that article too (it appeared in last month’s report when he created it). In August, the Cockstock Incident appeared on Wikipedia’s Main Page as a “Did You Know”. Cameo of Benedetto Pistrucci Image: Cameo of Benedetto Pistrucci.jpg, by Maria Elisa Pistrucci, public domain, via Wikimedia Commons. Gary Greenbaum at George Mason University brought the article about Benedetto Pistrucci to Featured Article. Pistrucci (1783-1855) was an Italian gem-engraver, medallist, and coin engraver who spent 30 years working on the Waterloo Medal, which was presented to the victorious generals at the Battle of Waterloo. Rosie Stephenson-Goodknight, Visiting Scholar at Northeastern University, continued to develop articles about women writers, including pages for American poets Martha Perry Lowe and Louise Chandler Moulton, as well as Hannah Adams, known for her works on comparative religion. Finally, we reached the end of User:M2545’s Visiting Scholarship at Rollins College. Over the course of the past year, M2545 has been one of the most prolific Wikipedians, making an extraordinary number of contributions to timelines and other articles relevant to the history and urbanization of the southern United States and connections between the U.S. and Cuba. Read more about M2545’s work in this blog post. In preparation for the start of the fall term, Wiki Education staff conducted a full review of our support materials, including Dashboard output, online trainings, and brochures. We started making a series of changes based on feedback from program participants, Wikipedia community members, questions we get from participants, and updates to Wikipedia. We also drafted a new discipline-specific handout on writing Wikipedia articles on history topics, which we posted for Wikipedia community review at the end of the month. In mid-August, Data Analyst and Storyteller Adam Hyland left Wiki Education. We thank Adam for all of his excellent work for our program over the last several years, and we wish him the best. Sejal and Camelia presented their work at the Hackathon showcase at Wikimania. On the technology front, August was a busy month of wrapping up summer projects and preparing for the new term. Sage and Sejal both attended Wikimania in Montréal in early August, meeting many users and potential users of the Dashboard and coordinating with others in the Wikimedia developer community and several Wikimedia Foundation teams. We completed updates of the Dashboard’s assignment design wizard output and some student training content, and also extended the integration between the the Dashboard and Salesforce. Thanks in part to volunteer contributions, the Dashboard also gained the ability to monitor for potential problems in two new areas: students editing Wikipedia articles that are under “discretionary sanctions” and have additional community scrutiny and special rules, and blocked edits so that we can quickly detect when student accounts — or the IP address of the Dashboard itself — is blocked from editing. We also completed accessibility validation and moved forward with the first steps of deploying a ticketing system for better management of support requests from instructors and students. In September, we will fully put this system, using the desk.com service, through its paces. The Dashboard also underwent several routine maintenance updates, including updating to the latest version of Ruby on Rails, version 5.1.3, and the latest version of the Ruby internationalization framework — both of which, for the first time, include open source contributions from Sage. For the month of August, expenses were $150,226 versus the approved budget of $193,339. The $43k variance can be attributed to some staffing vacancies ($3.2k) and less than anticipated spending on professional services ($17.3k), travel ($10k), printing ($10k), and meetings ($2k). Our year-to-date expenses of $298,336 are also less than our budgeted expenses of $365,338 by $67,002. Areas where our spending was significantly under budget include staffing ($5.4k), professional services ($36k), travel ($10k), printing ($9.8k), meetings ($4.6k), and communications ($1k). August was a busy month on the fundraising trail for Wiki Education. In total, we received commitments of $490,000 in grant funding in August, with most of this money expected to hit our accounts by the middle of September. TJ Bliss, Director of Development and Strategy, had initial phone calls or face-to-face meetings with staff at several large foundations. In general, we continued to look for funders who we felt might be interested in Wiki Education because our work on the Future of Facts, Guided Editing, and Sustaining Science initiatives. We have also continued to work closely with PRCO on our messaging guide and speaking opportunities list. TJ conducted interviews will all Wiki Education program staff during the month of August to help flesh out the messaging guide with anecdotes, stories, and other interesting facts. In conversations with potential funders, we began using anecdotes and data that were gathered from these interviews. In August, Frank joined staff and board chair PJ Tabit for Wikimania 2017 in Montréal. While he attended a number of sessions, he focused largely on connecting with education program leaders and decision makers. Together with PJ and LiAnna, Frank also met with a subgroup of Wikimedia’s Funds Dissemination Committee and talked about Wiki Education’s Annual Plan Grant application. After Bill Gong was actively recruited for and accepted a position as Director of Finance and Business within UC Berkeley (where he’ll have greater responsibility and direct reports), Frank started reorganizing Wiki Education’s financial and administrative support to cover everything that’s needed for ensuring a smooth day-to-day operation of our office after Bill’s departure in September. Also in August, Frank joined TJ for in-person meetings with potential donors, and continued working on proposals and project outlines.